If you are suffering with symptoms of ANY kind (unexplained weight gain, hot flashes, feeling blue, anxious feeling, upset stomach, inability to sleep OR want to sleep all day, or lack of energy to name a few,) it is NOT normal! Our bodies are meant to be symptom-free! Adrenal Fatigue is considered a 21st century epidemic. It’s actually more difficult to find someone who’s not dealing it than someone who is. 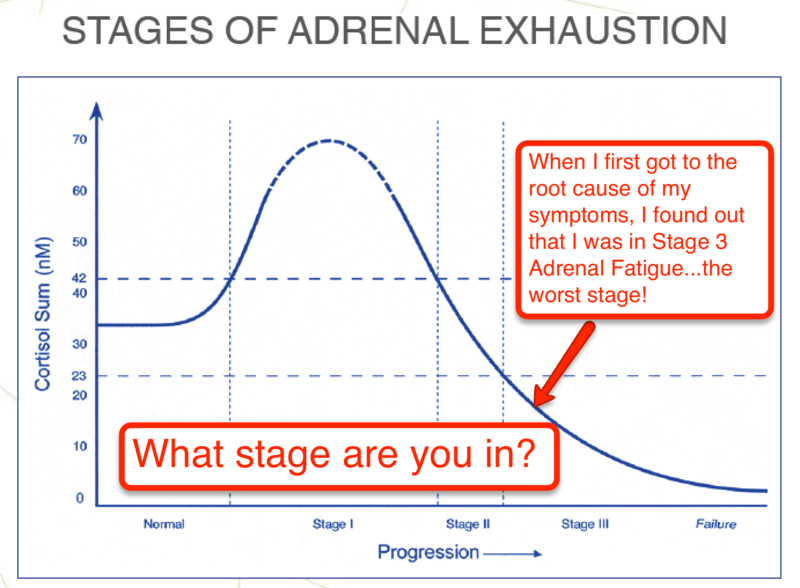 Adrenal Fatigue can be the catalyst for all of those vague, annoying symptoms so many us deal with & is often the gateway to gut dysfunction and poor immunity. Functional Diagnostic Nutrition™ can help you get to the root cause of these symptoms & put you on the path to healing. Every day, Rochelle helps people dealing with the Big 5: Weight Gain, Fatigue, Depression, Gut Dysfunction, & Female Hormone Balance. She not only understands the complexity of the situation but has experienced it herself. At the beginning of her own journey, she couldn’t sleep, was stressed all the time, and gained 20 lbs. despite exercising and eating right. Functional Diagnostic Nutrition helped Rochelle figure out why & has allowed her to heal naturally! Watch this short video explaining exactly what Functional Diagnostic Nutrition™ is, what it isn’t, and what it can do for You! Who is Functional Diagnostic Nutrition™ for? Someone who is committed to their personalized protocol for 3 months minimally. Someone who is tired of not feeling well. Someone who needs a step by step blueprint to achieve health. Someone who is willing to invest in themselves. Someone who wants to get off of medications. Someone who wants to get healthy naturally. Who is Functional Diagnostic Nutrition™ not for? Someone who is half-heartedly committed to their health. Someone who isn’t willing to make changes to their diet. Someone who prefers to see a doctor. Someone who struggles with following a protocol. Someone who isn’t willing to invest in themselves. Someone who is looking for a quick fix. We will look closely at your Adrenal/Hormone function using a saliva test. We will look closely at your Adrenal hormone function & your Female hormones using saliva tests. We will look closely at your gut function a stool test. The Metabolic Typing questionnaire ensures that you are on the correct meal plan for your specific body type. Includes 3 packages: The Nutrition, GI, & Stress (or PMS) Packages (HIGHLY recommended & most cost effective with savings of more than $2200) will provide comprehensive insight & clues into your body function & allow us to provide a very personalized protocol for a well-rounded approach to Your Ultimate Health! *All established FDN clients have option to add additional testing, follow up calls, & receive continued support in Inner Circle when program is completed. Have Questions? Click HERE & ask Rochelle LIVE on her Facebook Page! Serving clients residing in the United States & Canada. Rochelle is currently accepting new clients on a limited basis. Please CONTACT her Client Care team to discuss availability. **Refund Policy: We have a no refund policy for all our single/initial sessions and Basic/VIP packages. All sales final. **Rescheduling Policy: We have a 12-hour rescheduling policy. If you cancel less than 12-hours from the time of your scheduled appointment, you will be charged for the appointment. No exceptions. •Upon receiving her results video: Thank you for all of this information. It makes so much sense as to how I am feeling! I have to admit that in the first several minutes of your video, I cried like a baby. It was so good to have proof that what I am feeling is real! I am also down 9 lbs and my blood pressure this morning was the best it has ever been. My next goal is to get off of the blood pressure meds! Things are moving in the right direction. •My last (menstrual) cycle was the best in a while, with no pain and not much change or any cravings. •If you are tired, feel yucky and there’s nothing “wrong” with you, take a look at this. In less than 2 weeks, there has been a radical change in me – Public Service Announcement! •The best outcome so far was that I lost 5kg (ll pounds) of weight – feels awesome! •I feel like I’m getting some of my energy back! The changes I’m making are rubbing off on my entire family too because we hosted 2 dinners at our house this week and in the past people would have brought at least 4 different desserts each time. Instead there were no desserts and the veggie platter I put out was all eaten. It’s amazing how sweet some healthy foods taste when you’re not eating sugar! • It’s all because of you I’m able to tell the doctors what is wrong with my stomach. 2 of them have been trying to figure it out for 2 years. Thanks a million!! Disclaimer: This Site Does Not Provide Medical Advice The contents of the Your Best Life Site, such as text, graphics, images, hyperlinks to other websites, and other material contained on the Your Best Life Site (“Content”) are for informational purposes only. The Content is not intended in any manner to be a substitute for professional medical advice, diagnosis, or treatment. Always seek the advice of your physician regarding any questions you may have regarding your personal medical condition. Never disregard professional medical advice or delay in seeking it because of something you have read on the Your Best Life Site. Liability of Your Best Life: The use of the Your Best Life Site and the Content is at your own risk and provided on an “as is” basis. The inclusion or exclusion of any Content in no manner is a substitute for the informed consent process that must take place between you and your physician regarding any medical treatment or procedure. YOUR BEST LIFE DISCLAIMS ALL WARRANTIES, EITHER EXPRESS OR IMPLIED, STATUTORY OR OTHERWISE, INCLUDING BUT NOT LIMITED TO THE IMPLIED WARRANTIES OF MERCHANTABILITY, NON-INFRINGEMENT OF THIRD PARTIES’ RIGHTS, AND FITNESS FOR PARTICULAR PURPOSE. Without limiting the foregoing, Your Best Life makes no representations or warranties about the following: 1. The accuracy, reliability, completeness, or timeliness of the Content provided on or through the use of the Your Best Life Site. 2. The satisfaction of any government regulations requiring disclosure of information on prescription drug or medical device products with regard to the Content contained on the Your Best Life Site. In no event shall Your Best Life or any third parties mentioned on the Your Best Life Site be liable for any damages (including, without limitation, incidental and consequential damages, personal injury/wrongful death, lost profits, or damages resulting from incomplete or corrupted data) resulting from the use of or reliance upon, the Your Best Life Site or the Content, whether based on warranty, contract, tort, or any other legal theory. When using the Your Best Life Site, information will be transmitted over a medium that may be beyond the control and jurisdiction of Your Best Life. Accordingly, Your Best Life assumes no liability for or relating to the delay, failure, interruption, or corruption of any data or other information transmitted in connection with use of the Your Best Life Site.